Elefun & Friends Make Games Fun for Little Kids! Giraffalaff Limbo is a cute version of traditional limbo. With just a few minutes to assemble (and batteries, of course), this game is ready to go for all preschoolers. They spin the spinner to figure out how they need to go under the limbo pole (which is adorned by the laughing giraffe). When the music starts, kids can crab walk, crawl, or just scoot under to avoid knocking that mocking giraffe from his place. It's a hoot, and my kids loved the tropical music and the giggles that came from all of the players. Take your family fun online, with the special code that comes inside each Elefun & Friends game box. By visiting www.elefunandfriends.com, you can get access to a special animated short and play exclusive games. These are games that keep on giving! *Hasbro and MyBlogSpark provided the sample and prizes for this review. My son would love Giraffalaff Limbo!! Because I know that there is no way I could do the limbo, I think The Scatterpillar Scramble would be the safe way to go. Giraffalaff Limbo would be a hit in our house. Even Daddy might get in on the fun. I think the Giraffalaff Limbo would be lots of fun. I think my daughter would really like Scatterpillar Scramble. Scatterpillar Scramble would be great at our house. Thanks! I think my whole family would like Scatterpillar Scramble! I like the Scatterpillar Scramble. Thanks for the chance. I think my son would enjoy the Giraffalaff Limbo the most. Both of my kids played Limbo at a party in the summer and keep talkinga bout that for their parties next year so I pick Giraffalaff Limbo. The scatterpiller scramble looks like loads of fun! 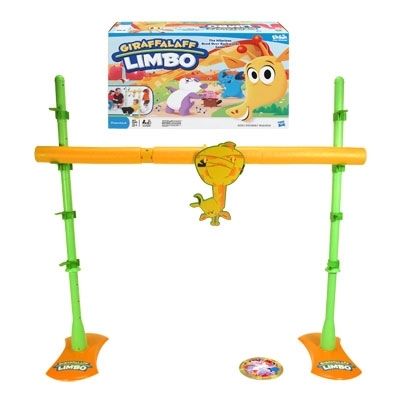 Giraffalaff Limbo looks like it would be a blast for my 2 little ones! Giraffalaff Limbo looks like a lot of fun. The games are so cute! We like The Scatterpillar Scramble. Giraffalaff Limbo...just the name makes me giggle! My son is only 2. So I think the Giraffalaff Limbo would be most fun! We are a family of game players! Both of these games sounds so fun. especially fun and I like that both games require activity! We would pick the Giraffalaff Limbo Game. My son would really enjoy giraffalaff limbo. Thanks for the chance. Probably the Scatterpillar Scramble but they both look really cute. I would try them out during one of our family fun nights. I think my son would love Scatterpillar Scramble. Thanks! Right now I think Giraffalaff Limbo would be the most fun in our house. 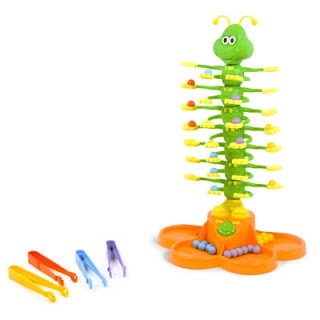 I could see my two little nephews getting a little frustrated with Scaterpillar Scramble. But in another year or so, as the subtlety of their motor skills increases, I think they will have lots of fun with Scaterpillar too. Thank you for the chance to win. I think they would like Scatterpillar Scramble. It would be fun to see the kids play the Giraffalaff Limbo! Thanks! I think the Scatterpillar Scramble would be our favorite in the house cause everyone could join in. Both games looks great, but the Giraffalaff Limbo looks really fun for kids! My boys would love Scatterpillar Scramble. My kids would like the Giraffalaff Limbo. I think my kids would like Giraffalaff Limbo the best. I think we would most enjoy the Elefun game! The Scatterpillar Scramble looks like a lot of fun! Thanks for the contest! My kids would love Giraffalaff Limbo. Thanks! Giraffalaff Limbo would be a hit in our house! Giraffalaff Limbo looks super fun! Today's comment. Thanks and Happy Holidays! My neice really wants the limbo game. My granddaughters and their friends would have so much fun with the Giraffalaff Limbo!